A classic method for earning a quick sawbuck is to bet someone that you can find the word “Wisconsin” on a US $5 bill. You’ll need a magnifying glass, but there it is, around the top of the Lincoln Memorial. If you’re bored with that bet, or if you just want a change of pace, bet someone you can name two Academy Award winners who have published papers in neuroscience. As Mind Hacks has already pointed out, both Natalie Portman (neé Hershlag) and Colin Firth (neé Firth) have played a prominent enough role in recent neuroscience research to merit mentions as fifth and third authors, respectively, on neuroscience research papers. The Kanai et al. 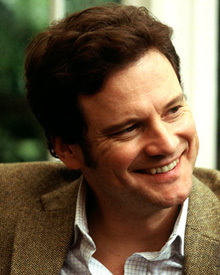 paper, on which Firth is an author, has already been covered in this blog. The story of how Firth (and fellow BBC radio host Tom Feilden) came to be co-authors with Kanai and Geraint Rees has been explained in the Neurocritic blog. Firth originally commissioned Kanai and Rees to scan the brains of two British politicians, one liberal (Labour), one conservative. Since an N=1 in each experimental condition was not enough to make much of a study, Rees then went back and retrospectively gathered political affiliation data for 90 undergraduates whose brains had been previously scanned. Feilden explains here. We’ve already discussed the data in a previous blog post. According to the Kanai et al. paper, conservatives tend to have a larger amygdala, a structure in the brain well-known for its involvement in fear processing. Liberals have a larger anterior cingulate gyrus, which is known for processing conflicting information, especially that with a strong emotional component. Both are parts of the limbic system, which is a set of loosely connected emotional structures which surround (limn) the core of the brain, the brainstem. Natalie Portman, who publishes her research under her birth name of Natalie Hershlag, already has two scientific papers to her credit, so her scientific output is double that of Firth, even though they have the same number of Oscars®. Her first published paper, “A simple method to demonstrate the enzymatic production of hydrogen from sugar”, was based on her high school science fair project. Natalie Hershlag of Syosset High School is listed as second of three authors on this paper which showed how garbage (which contains cellulose, a polymer of glucose) can be degraded into hydrogen, a clean fuel. The most common method to look at blood flow is functional magnetic resonance imaging (fMRI). For example, I’ve participated in studies to look at how the patterns of blood flow in the brain change as a result of answering hard vs easy math problems. For obvious reasons, getting an infant to lay still in a huge, thrumming magnetic tube for 20 minutes and perform the behavior you want is not bloody likely, as Colin Firth would say. The near-infrared spectroscopy method collects similar information without the clear spatial resolution (i.e. brain maps) that you get from fMRI, but the advantage is that it is mounted inside a headband that allows the infants to play and sit quietly on their mom’s lap. Baird et al. studied object permanence, the idea that if an object such as a toy is seen, then covered with a cloth or vertical blind, that it remains in the same place unless moved (the basis for the game “peek-a-boo“). They showed that development of the frontal cortex (as we’d expect) is critical for the appearance (!) of object permanence at about 7-9 months. If Marisa Tomei (or any other Oscar® winner) is interested in participating in our studies of math anxiety using fMRI, she should click on the “About” link above and contact me. Contrariwise, if my Facebook and Twitter friend Starina Johnson thinks that co-authoring a scientific paper will help her win an Academy Award, let’s talk.